ViewDock facilitates the interactive analysis of receptor-ligand docking results. Users can click through a list of docked compounds (or different poses of a single compound) to view them individually in the context of a binding site. The dialog shows chemical names, docking scores, and other information read from the file. Docking results can be sorted, classified by interest level, and saved for future reference. ViewDock was originally developed to handle output from DOCK, but has since been enhanced to support results from other programs. For a step-by-step example, see the ViewDock tutorial. Another way to start ViewDock is with the viewdock command, which loads a specified file of docking results. When the file of docked molecules has been read, the ViewDock ListBox will appear and the first molecule will be displayed in the main Chimera window. In most cases, a user will also display the receptor structure, which can be opened either before or after the file of docked molecules. ViewDock is controlled via the ListBox and its menu. The listing can be sorted by the values in any column (except diagrams) by clicking the column header. Clicking the header once sorts the entries in order of increasing value and places an up arrow in the header. Clicking again sorts the entries in decreasing order and places a down arrow in the header. A compound can be chosen by clicking on its line in the upper panel. Multiple compounds may be chosen at once. Chosen lines are highlighted and only the chosen compounds are displayed. Ctrl-click adds to an existing choice rather than replacing it. To highlight a block of compounds without having to hold down the mouse button, click on the first (or last) and then Shift-click on the last (or first) in the desired block. Depending on the docking program and version used, the lower panel may show more detailed information when a single compound is chosen. Compound descriptors read from the input file are assigned as attributes of molecules (molecule models). The attribute name is based on the descriptor name with dock prepended. Such attribute assignments allow docked compounds to be rendered (with colors or radii) or selected by their descriptor values. Hide dismisses the ListBox without exiting from ViewDock. Quit exits from ViewDock and closes the docked molecules (like File... Close in the ListBox menu). Help brings up this manual page in a browser window. When the ListBox is hidden or obscured by other windows, it can be resurrected using the Raise option for the ViewDock instance in the Tools menu. The instance's Hide and Quit options have the same effect as the corresponding ListBox buttons. Three mutually exclusive states are possible for each compound: Viable, Deleted, or Purged. The initial state is viable, but if a molecule is deemed uninteresting, it can be changed to deleted or purged by clicking on the checkboxes near the bottom of the ListBox. Clicking a status checkbox changes the status of all chosen compounds. In general, Viable compounds are interesting (or have not been looked at yet), Deleted compounds are less interesting but may deserve another look, and Purged compounds are meant to be discarded. The Compounds menu controls (based on status) which compounds are listed in the upper panel. When structures are written out using File... Rewrite, viable and deleted but not purged structures are included in the output file. In contrast, structures in all three states are included in a file written out using File... Save or File... Save As. The states of the molecules are also recorded in these output files, which can be input to later sessions of ViewDock. No matter how the molecules are sorted in the ListBox, they remain in their original order in a saved PDB file. The HBonds menu allows incorporation of hydrogen bonding information calculated with FindHBond. If FindHBond has not already been run, its interface will appear. If FindHBond has been run, but one wishes to run it again with different parameters, it can be started from the main Chimera Tools menu or by using another of the standard ways to start tools. When FindHBond is used to help screen compounds in ViewDock, the inter-model setting is most efficient. The hydrogen bond descriptors can then be used to choose compounds by value or guide manual changes in compound status. Compounds can be chosen based on the values of any (or all) of the available descriptors, including hydrogen-bond statistics calculated with FindHBond (see the HBonds menu). Compounds... Choose by Value brings up a dialog for defining value ranges. Whichever descriptors are shown in the ListBox are available for choosing compounds. To add a descriptor to the Choose by Value dialog, simply show the descriptor in the ListBox using the Column menu. Any descriptor shown in the ListBox but not of interest for choosing compounds can be disregarded by unchecking the corresponding checkbox. Checkboxes under Choose from designate which compounds should be considered, on the basis of their status. The values displayed in the histograms and/or lists only come from this designated set of compounds. Numerical descriptors are depicted in a histogram. Within a histogram, two markers are shown as vertical bars. Clicking on a marker shows its Value in black. Clicking elsewhere within the histogram shows the Value (X-coordinate) of the mouseclick in gray. A marker can be moved by changing its Value and then pressing Enter (return) or by dragging it horizontally with the left mouse button. Holding the Shift key down reduces the speed (mouse sensitivity) of marker dragging tenfold, allowing finer control. Only compounds with values between the markers (inclusive) will be chosen. String-valued descriptors are displayed as a list. Clicking a line highlights just that line; Ctrl-click adds to an existing choice rather than replacing it. To highlight a block of lines without having to hold down the mouse button, click on the first (or last) and then Shift-click on the last (or first) in the desired block. Only compounds with highlighted values will be chosen. A message of the form N of M compounds applicable reports how many of the compounds (N) of those designated to choose from (M) meet all current criteria. These compounds will be chosen when Apply or OK (which also dismisses the dialog) is pressed. Display can controlled in many ways. Because of the potential for confusion, however, it is recommended that the ViewDock ListBox, not commands, be used to control the display of the docked compounds. The remainder of this section explains the interplay among display controls, but can be skipped if only the ViewDock ListBox will be used to control compound display. Compounds whose display has been disabled at the model level are unresponsive to the command display. Ways of enabling display at the model level (and restoring responsiveness to the command display) include choosing the compound in the ListBox upper panel, using one of the Chimera... Show options, and using the command modeldisplay. will display only the compounds whose display is enabled at the model level. The Compounds menu controls which compounds are listed in the top panel of the ListBox. Any combination of the first three entries may be checked to indicate which status types should be listed. Read... read a text file specifying which descriptor columns should be shown after the S (status) column. The format is one descriptor name per line, entered exactly as shown in the Show/Hide menus, in the desired order. The file should not contain any blank lines. Any existing columns of descriptors will be replaced by the those specified in the file. A compound's diagram will be blank until results are returned, and image generation may not work for all compounds. The following checkboxes are mutually exclusive and control how picking from the graphics window is handled by ViewDock. 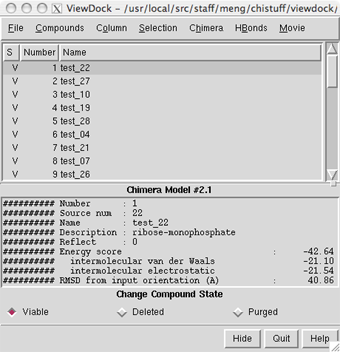 The Hide and Show options toggle the display status of compounds in the main Chimera window. The HBonds menu allows incorporation of H-bond information calculated with FindHBond. Add Count to Selected Atoms - add descriptor columns listing the number of H-bonds between a ligand and the currently selected atoms of the receptor and the numbers of ligand atoms and receptor atoms, respectively, involved in these H-bonds (a given atom may participate in more than one H-bond). If the selection is later changed, this menu item must be chosen again to refresh the numbers. Note that DOCK 4 interprets information about each molecule as Name or Description based on where this information occurs in the input database file. Here are examples of a single molecule from (A) a Mol2 database file input to DOCK 4, (B) a Mol2 output file from DOCK 4, and (C) a PDB output file from DOCK 4. Multiple-molecule files are simply concatenations of the data for single molecules. Number is sequential number in order of occurrence in the file from DOCK, and Source num is the sequential number in order of occurrence in the database file input to DOCK.